Is it difficult being a television reporter? Demanding? Stressful? Without a doubt. But those aspects of the job have never discouraged Hank Phillippi Ryan. In fact, she’s won 26 Emmys and 12 Edward R. Murrow awards to prove the point. She’s also received dozens of regional, national, and international awards for her unique style of “hard hitting investigative reporting.” There isn’t enough room in this feature to list them all. Just as the FBI has adopted the words, Fidelity, Bravery, and Integrity, Hank could adopt the words, Poise, Courage, and Commitment. She has all of these qualities and more. For three decades, her profession has been to investigate high profile news stories and then report the findings on television. Hank is also on call for live breaking news as it occurs, even at 3am. As you read this interview, you’ll discover being a TV investigative reporter isn’t all roses—far from it. Some live shoots are inherently dangerous. You don’t have to be embedded with combat troops to be at risk. News reporters tend to follow the most spectacular events and Hank has reported from many hazardous situations. One of the interview answers below lists some of her more harrowing moments. It’s all worth it. Hank’s reporting makes a difference. Some of her investigative segments have changed laws and made the Boston area a safer place to live. And yet, Hank’s not satisfied with the status quo. Several years ago she raised the bar and pursued a second career as a mystery novelist. So who is this fascinating and incredibly beautiful woman with the ability to make an ice cream cone with a curl on the top? And why—as a childhood dream—did she want to be Nancy Drew? But most importantly, why is Hank Phillippi Ryan driven to constantly push the envelope and seek new adventures? In a word—excitement. Hank loves to be challenged both professionally and personally. It’s probably easier to become a space shuttle pilot than to land a publishing contract in the mystery/thriller genre. Of course the NASA folks would disagree and they’d have a valid argument, but it’s meant only as rhetorical likeness. Bottom line? It’s not easy to write commercial fiction, especially when holding a full-time job. So let’s take a closer look at one of the mystery genre’s rising stars! As authors, we project parts of ourselves into our main characters. Charlie McNally has many of your qualities, but how is she different from you? Ah. I’ve spent the last several years denying Charlie is me. Fine. Fine. Here in the privacy of this interview, I’ll say it. She’s me. What can I tell you. Like Charlie, I’ve wired myself with hidden cameras confronted corrupt politicians, chased down criminals. I’m a veteran journalist who’s worried about the job security of a career in television, and also about what happens when you’re married to a career in television and the camera doesn’t love you anymore. All true. Fine. And, in trying to write an authentic and genuine story about a TV reporter who solves murders, it would be silly to ignore all my experience and experiences. But I’m also not Charlie. She makes decisions I might not make. She’s a good and fearless driver. She’s single. I’m older than she is. I’ve been a TV reporter for more than 30 years so it seems to be (knock on wood) working out. I’m happily married. I’ve never been in a gun battle in an airport hangar. Yet. Do you think Charlie has evolved through your first four books? If so, how? Oh, sure. That’s part of my goal. She started out—what can I say—a bit self-absorbed. (I know, a TV reporter self-absorbed. Shocking) She started out devoted to her career, and with breaking the big stories being the only thing that was important to her. As she hit the big 4-6—she began to realize there might be more to life than work. And then—began to realize that loving your work isn’t so bad, either. She sees that much of life is juggling. And as the books progress, she learns to juggle. In PRIME TIME, the balance of real life and work life. In FACE TIME, her relationship with her mother, and how she’d deal with being a new stepmother. In AIR TIME, the struggle to tell ‘the real thing’—how do you know when you’re truly in love? And in DRIVE TIME, the tension of knowing when it’s time to say goodbye. All of course, while tracking down clues, following leads, discovering whodunit, surviving the showdown, and breaking the big story. If you had to use only three words to describe Charlie McNally, what would they be? Have you considered writing a solo novel with a brand new character? Yes, indeedy. More than considered. I love Charlie, but I am very, very excited about what’s underway. More than that, I cannot say. You write in first person, present tense. Was that a deliberate decision, or did it just feel natural to you? Yeah, you know, I never thought about it. Probably because when I started writing PRIME TIME, I had no idea what I was doing. I finally, after oh so many years, had what I thought was a terrific idea for a plot—secret messages in computer spam. I couldn’t wait to write the mystery about whether that could be done, and how, and most important, why? Just as with writing for television—which I have for so long!—I can’t write the story until I have the first line. I was in a restaurant, in the midst of blackened tuna sashimi, when the first line of PRIME TIME came to me. It was in first person—which I’m not quite sure I even realized, you know? It was just—right. And the books continued to make sense that way. Television is very fast-paced, very immediate, there’s no looking back and no time for contemplation or over-analysis. (You watch TV right?) So as it turned out, writing in first person—letting the reader be on the train with Charlie, discovering things as she does and figuring things out as she does—really seemed to be right. Also, what I adore about first person is that it allows me to play with perception. Because the reader only knows what Charlie knows, they may or may not agree with her decisions. And of course, Charlie could be wrong. So as the author, I know what I know, I know what Charlie knows, and I know what I want the reader to suspect. And that’s fun. And effective. Is there any one author you’d consider to be the most influential in your writing career? Impossible. Impossible. Shakespeare. Edith Wharton. Stephen King. Agatha Christie. Mark Helprin. Tom Wolfe. Tom Stoppard. More recently, for mysteries and thrillers? John Lescroart. Lisa Scottoline. Frederick Forsyth. David Morrell. Lee Child. Not many authors can make writers conferences financially viable—as far as book sales go—and yet you attend lots of them, including ThrillerFest. Why are they so important to you? (You’re supposed to sell books? What a concept.) Couple of things. First, I go to learn new things. I actually go to panels, imagine that, and come back with notebook pages of ideas and thoughts and insights. I’m delighted to teach classes, too. After wiring for so many years, I realize I do have things to share, and they seem to make a difference. So that’s very gratifying. I also go to meet my fellow authors—it’s still a huge thrill for me to hang out with the people I used to know only from photos on book covers. (And hmm, some don’t look exactly like they do in those pictures…) I’m constantly impressed with everyone’s generosity, good humor, and genuine interest in their colleagues. Some of the best friends in my life, I met at these conferences. And of course, to meet readers. Is there anyone who isn’t euphoric when someone you don’t know asks you to sign a book? Or wants to discuss them? Or tells you how much they enjoyed them? I can go for days on that. And you know, something wonderful always happens at every conference. One special thing. I’ve never seen it fail. 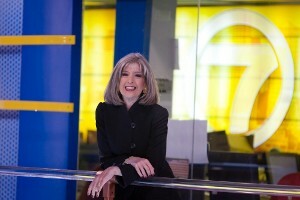 What does a Hank Phillippi Ryan workday look like—from beginning to end? Yikes. Get up. Find coffee. My husband and I drive to work together…serendipitously; his office is two blocks from Channel 7. I read the newspaper out loud to him on the way to work—and I try to insert fake facts into the stores to see if he notices. Sometimes, he does. I get to the starting at about 9. Find more coffee. Depending on the day. I may be in research/reporting mode, or shooting mode, writing mode or in editing. I could be going undercover, or using a hidden camera, or making a million phone calls. I could be doing a confrontational interview or talking with a victim, or going through piles of documents. And there’s always the possibility of breaking news, which means all bets are off. We leave around 6:30 or 7? And when we get home, I write til about 9:30. Make dinner, (lots of carry-out salmon. I used to be a good cook, loved it, but something has to go.) My husband and I have dinner together, watch the news. And then I write a bit more. You do a lot of writing for your television career, can you tell us about that? What kind of writing, etc? When I started as a TV reporter, in 1975 (!) in Indianapolis, I was covering the presidential election campaign, so my stores were all political. When the election was over, they decided I should ALSO be the movie critic, and have a weekend talk show. I moved to Atlanta where I was the political reporter, than changed to being the “on the road” reporter. I had a big map of Georgia on my office wall, and each Monday I would close my eyes and point. My photographer and I would head out to wherever I’d pointed, and I’d figure out three stories to do (they all had to be about economics). That was a fabulous experience—it made me observant, and empathetic, and brave, and fast. It was incredibly challenging. I moved to Boston as a “general assignment” reporter. That meant—every day, something different. Fires, murders, politics, hurricanes, basketball playoffs, cat shows. Two minute stories. It’s kind of surprising—I turned into the “funny” one. Whenever there was no news, they’d say, “Get Hank,” she’ll come up with something. (In fact they called me “something out of nothing productions.”) I did all kinds of features. It was hilarious, and creative, and taught me a lot about what makes something funny. Then in 1988 during the presidential campaign, I was assigned to do the “think pieces”—long form in-depth stories, maybe 6 minutes each, about history and biography and politics and campaigns and political science. It was a terrific experience, and afterwards, my news director said he didn’t want me “back on the street”—that he wanted me as investigative reporter, doing only long-term headline-making stories. And that’s what I’ve been doing ever since. So—so far, so good. So it’s interesting. I started writing mysteries in…2004? But I’ve been telling stories on television, long and short, funny and dramatic, for more than 30 years. I think that’s made a huge difference in my mystery writing. It’s a very, very similar skill. Except in TV, you can’t make stuff up. Can you tell us about your most dangerous or risky television reporting assignment? Oh, gosh, Unlike Charlie, I’ve never been held at gunpoint or been chased through the twisty corridors of deserted buildings. Yet. But I’ve had people threaten me, slam doors and stand in front of them to keep me trapped in a room. I’ve had judges scream at me, and people chase me and slam doors in my face and threaten me with everything imaginable. An angry person came to my house once—that was no fun. I’ve had people confess to murder. Gone into houses behind swat teams. Been tear-gassed. Gotten a bit too close to burning houses. Mostly, people call and yell at me. They say—how could you do this to me? I say: I didn’t do anything. YOU did. I just reported it. Don’t be daunted that it’s difficult. It’s really hard work, and any real writer will admit that. Thing is, the difficult part can be fun and rewarding and fabulous. Also—when there’s a disappointment, don’t dwell on it. It may be the best thing that ever happened to you. You just don’t know it yet. What do you do for recreational fun? Are you kidding me? When would I do that? Your favorite wine or drink? Is there something you’ve always wanted to do? Bungi jumping? Skydiving, etc? Do you travel for work? And what do you think of these new TSA body scanners? I don’t often travel by plane for work. But I often do stories at airports! (That’s where the inside stuff in AIR TIME came from.) Those scanners? I’ve gotta tell you. I don’t care one bit. Scan away. Are there any beloved pets you want mentioned? Do you have a favorite charity you like to support? My husband (a criminal defense attorney) just represented a teenager with Asperger’s in a murder case, so that’s in our radar right now. I do lots of literacy events, and since my sister has Crohn’s Disease, that’s on my mind, too. This was a challenging assignment. There’s a wealth of information on Hank Phillippi Ryan on the internet and I had to sort through tons of reading and research. The goal of a Between The Lines interview is to give readers a deeper look, but I’d literally need several dozen pages. It’s an admirable goal and reflected in her work. On The House won the 2009 Anthony, Macavity, and Agatha awards for best short story. Here’s a quick plotline: When true love goes wrong, a woman’s best friend may be her dog. Or—not. On The House is available in the new anthology QUARRY from Level Best Books. The awards are a reflection of Hank’s commitment to keep improving her craft. I’ve been seated next to Hank in ThrillerFest workshops and she’s always taking detailed notes. Not all authors do that, more should! Each of Hank’s novels are freestanding stories, but as stated above, Charlie has undergone a character arc of sorts, so it’s probably best to start with the first book in the series. Investigative reporter Charlotte McNally is an expert at keeping things confidential, but suddenly everyone has something to hide—and even Charlie realizes it’s possible to know too much. Her latest television scoop—an expose of a dangerous car scam, complete with stakeouts, high-speed chases and hidden-camera footage—is ratings gold. Now, in the prime time of her journalism career, it seems like Charlie’s dreams are about to come true. If she can just balance her career and her upcoming wedding—perhaps she can really have it all. But soon Charlie’s personal and professional lives are put on a terrifying collision course. Her fiancé is privy to information about ugly phone calls at an elite private school, threats that are suddenly turning deadly. There’s a mysterious death. And then—another. Her soon-to-be stepdaughter may be in danger. Her fiancé comes under suspicion. Then Charlie’s career takes a turn she never could have predicted. Charlie was starting to believe in second chances, but now she must face the chilling reality: revenge, extortion, family secrets, and murder may leave her alone again—or even dead. What a great premise! I love it. Although there’s plenty of action in Hanks books, they’re character driven. Charlie is a fascinating person with strong motivations. She’s street smart and can take care of herself. After all, she works in an industry that doesn’t slow down and doesn’t tolerate mediocrity. If the stakes aren’t high enough, the story gets dumped and she’s often worried she’ll be dumped right along with it. The only way to survive is to push the envelope. Sound familiar? The Charlie McNally books are quick reads and would make great Christmas gifts. All four novels are mass-market paperback releases so they won’t break the bank. If you’ve got a voracious reading appetite, or know someone who does, then Hank’s books fit the bill. I encourage you to visit her website at www.hankphillippiryan.com. It’s easy to navigate and looks great. And The Boston Globe article reveals the mystery of how she acquired such a terrific name! Agatha, Anthony, Macavity, and Emmy award-winning investigative reporter Hank Phillippi Ryan is on the air at Boston’s NBC affiliate. Her work has resulted in new laws, people sent to prison, homes removed from foreclosure, and millions of dollars in restitution. Along with her 26 Emmys, Hank’s won dozens of other journalism honors. She’s been a radio reporter, a legislative aide in the United States Senate and an editorial assistant at Rolling Stone Magazine working with Hunter S. Thompson. And yes, she once worked at a Dairy Queen. Hank currently lives in the Boston area with her husband. Andrew Peterson is the author of First To Kill, the debut in a series featuring Nathan McBride, a former marine sniper and CIA operations officer.The next McBride novel, Forced To Kill, will be available early next year in exclusive audiobook format from Audible.com.Andrew works as a volunteer firefighter, enjoys scuba diving, target shooting, flying helicopters, hiking and camping, and an occasional sad round of golf.